Combine all the above ingredients in a large bowl. Mix it well till all the flavors combine. Refrigerate it or leave it at room temperature for half an hour before serving. 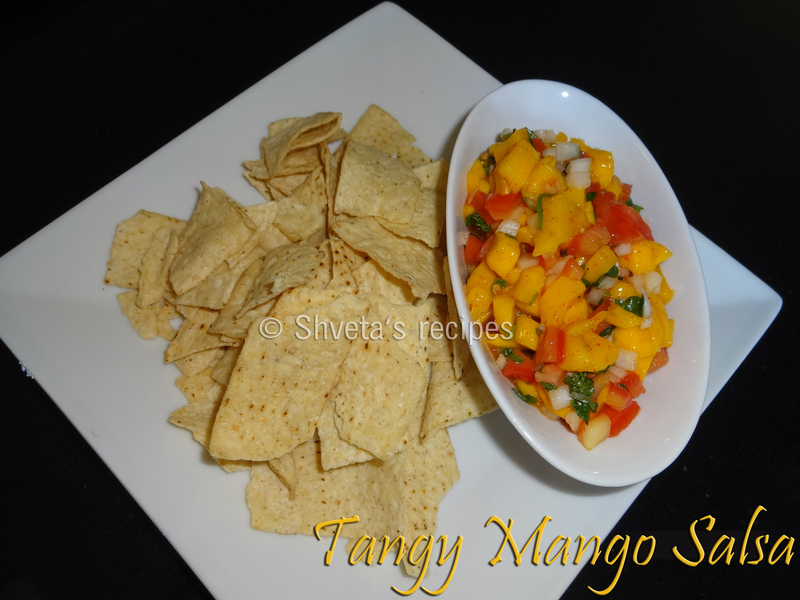 Serve fresh and tangy mango salsa with your favorite chips. Enjoy! 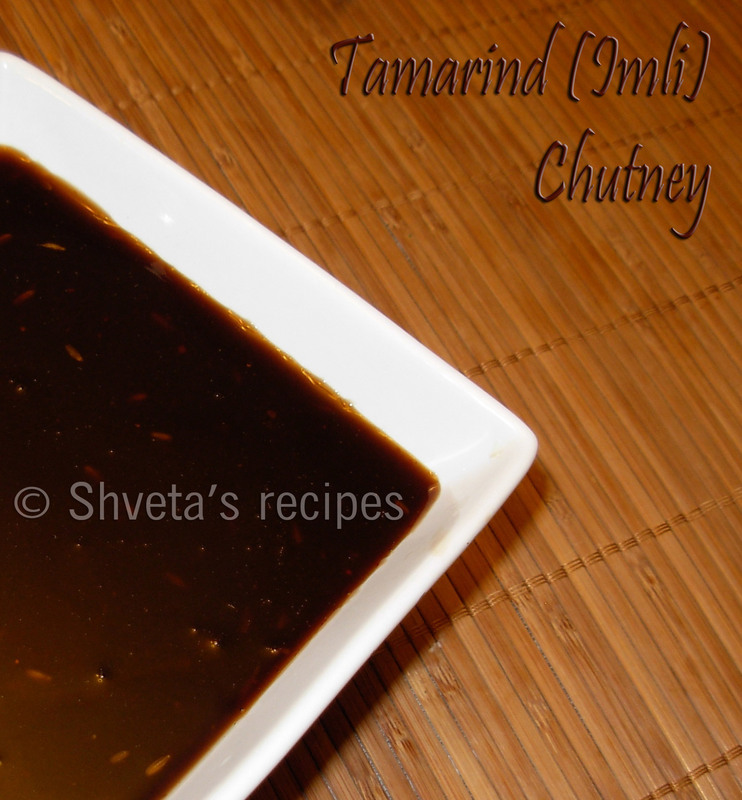 Tamarind or Imli chutney is a must condiment for any chaat snack. It can be prepared in advance and can be stored for days. In a heavy bottom pan, add tamarind, dates and water. Boil it first and let it simmer on medium low heat for 15 minutes. Check, all the dates and tamarind become pulp. Cool it a bit and sieve the pulp through a thin strainer. Put the pulp back in the pan; add jaggery, sugar and all the spices. Cook on medium low heat till the sauce starts to thicken. Dip a spoon in the sauce, if it coats the spoon evenly and is not too runny, tamarind chutney is ready. It can be stored in an air tight container, in the refrigerator for a month. 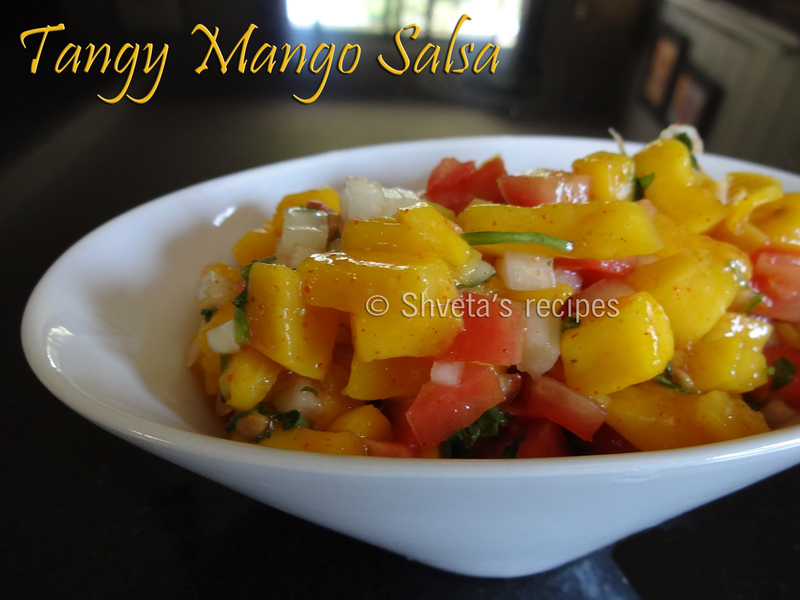 Enjoy tangy and sweet tamarind chutney with your favorite snack or in any chaat. 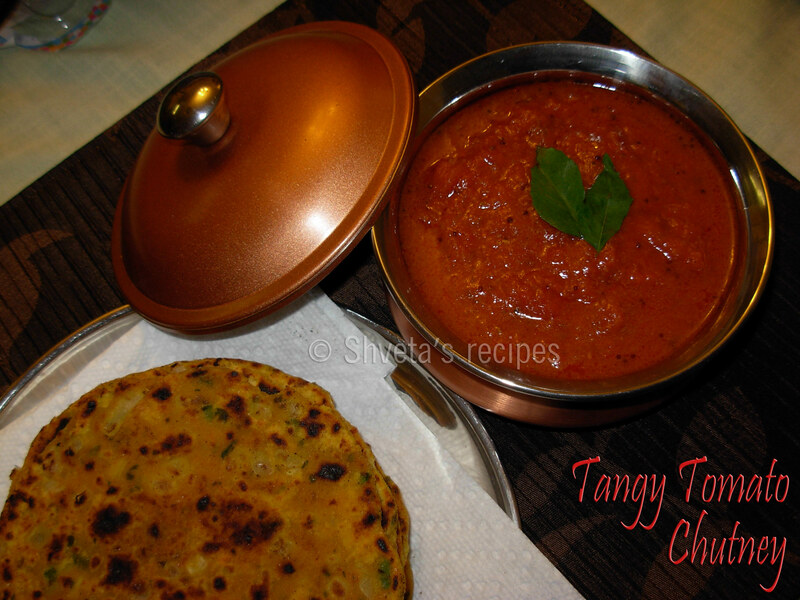 This tangy tomato chutney is my mom’s recipe. 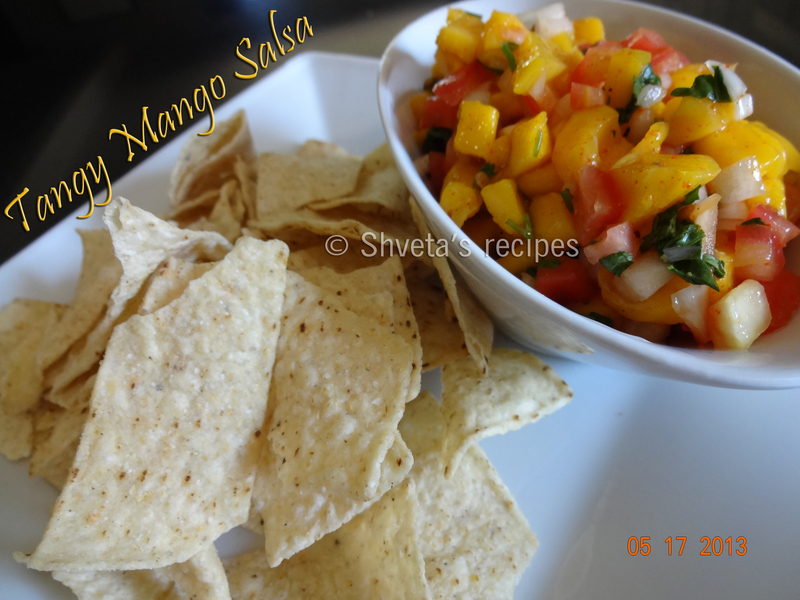 I have been eating this chutney since my childhood and often love to make it myself. Dice tomatoes in small cubes. Keep aside. Heat olive oil in a pan, cumin seeds and mustard seeds. Let it crackle. Then add asafatida powder and sliced onions. Saute it, till turns light golden. Add ginger-garlic paste, chopped green chilies and fresh curry leaves. Cook for 2 minutes. Add diced tomatoes, red chili powder, garam masala powder, coriander powder and let it simmer for 10 minutes on medium-low heat. Add sugar or gur to the gravy and simmer it on low heat for 5 more minutes. 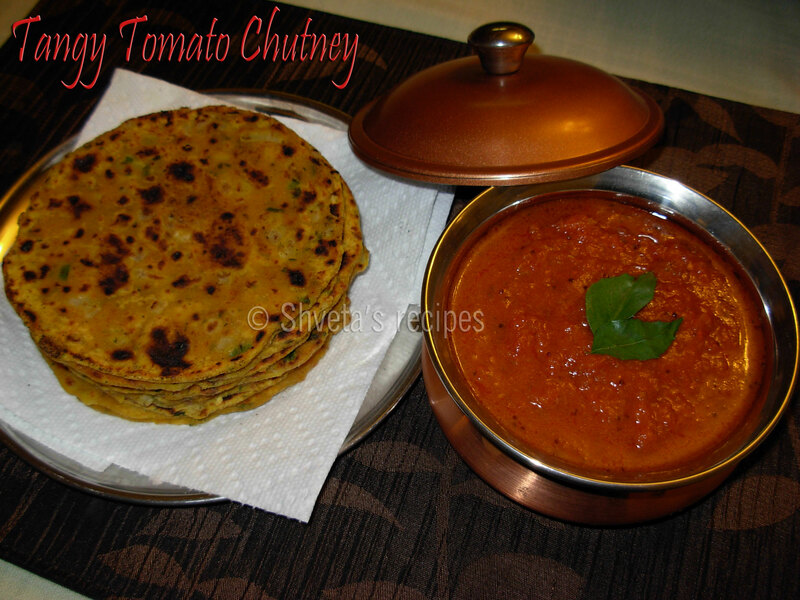 Garnish tangy tomato chutney with freshly chopped cilantro. Enjoy with methi paratha or any other paratha of your choice. Wash and dry lemon and green chilies separately. 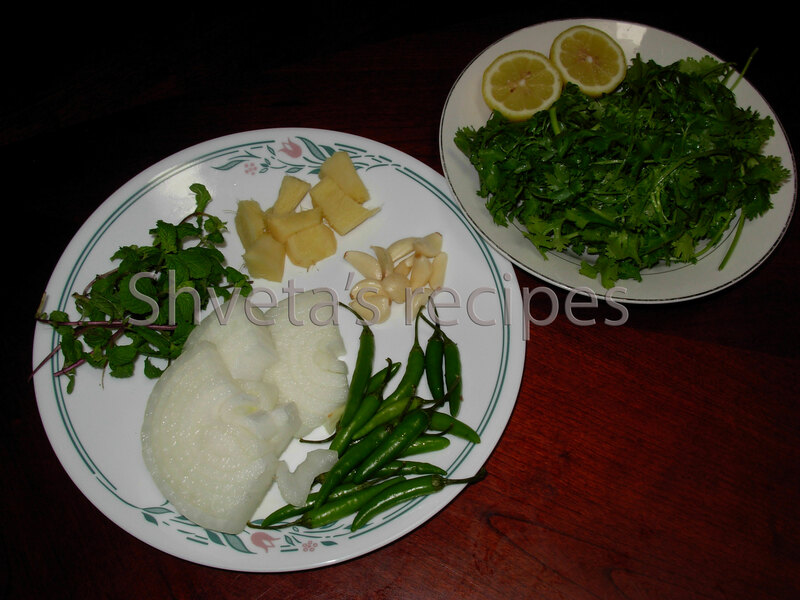 Cut lemon and green chilies into small pieces. Try to discard all the lemon seeds. Add turmeric and salt to lemon and green chilies and keep it in a glass bowl over night. Next morning, mix well and keep aside. In a pan, dry roast cinnamon, cloves, coriander, fenugreek, cardamom, black pepper and fennel seeds. Grind the roasted spices in grinder and keep aside. In a large bowl, mix all the above roasted spices and also add red chili powder to it. Heat oil in a separate pan and add it to the spice mix. Mix well. Add all the above mixture to the lemon and green chilies. Once again mix well. Take a clean jar; fill it up with the above pickle. Also add some hot oil on the top. So the pickle is completely submerged in the oil. Store it in a clean and dry place. Pickle is ready to eat in a week. 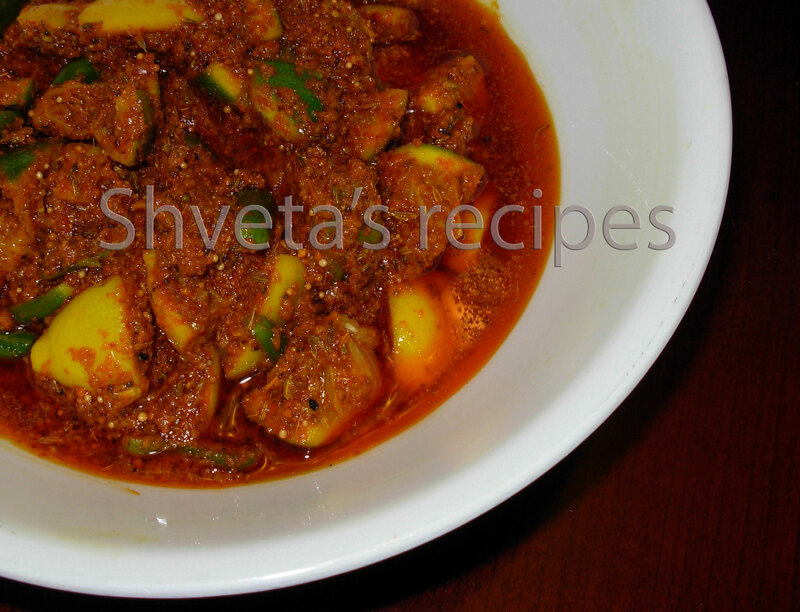 Enjoy Lemon-chili pickle with garma garam parathas [Indian bread] anytime of the day. 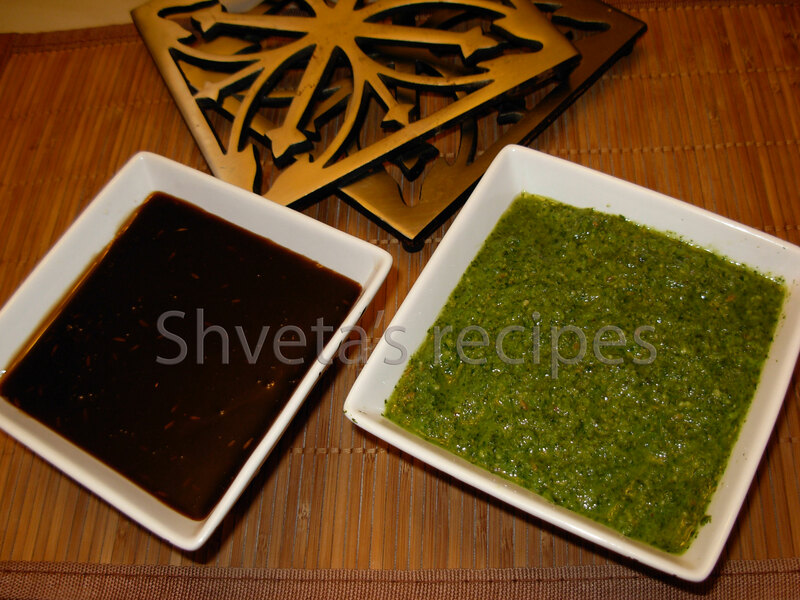 One of my favorite condiments is green chutney. It is so refreshing; it reminds me of cool summer days. 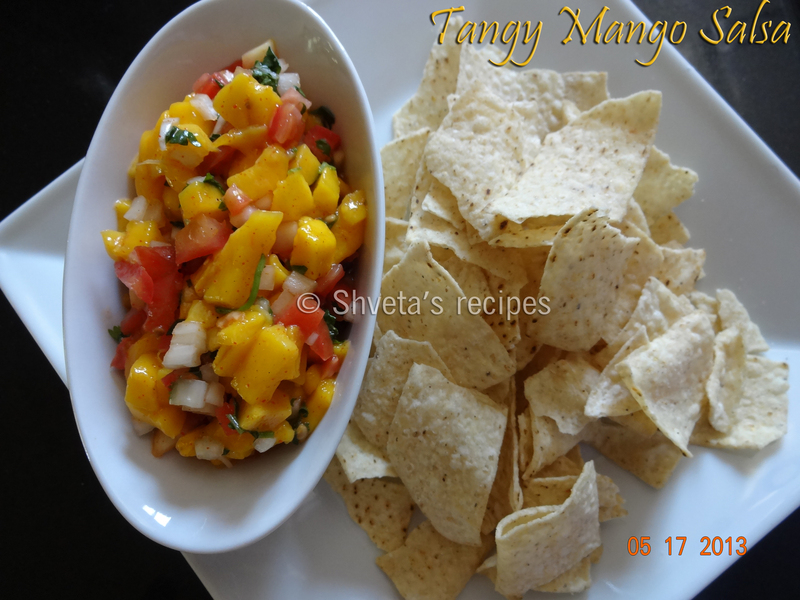 It can be accompanied by most of the appetizers and it is also great with a meal. It is good for health as it helps digest the food properly. You can make this chutney in bulk and freeze for weeks to come. 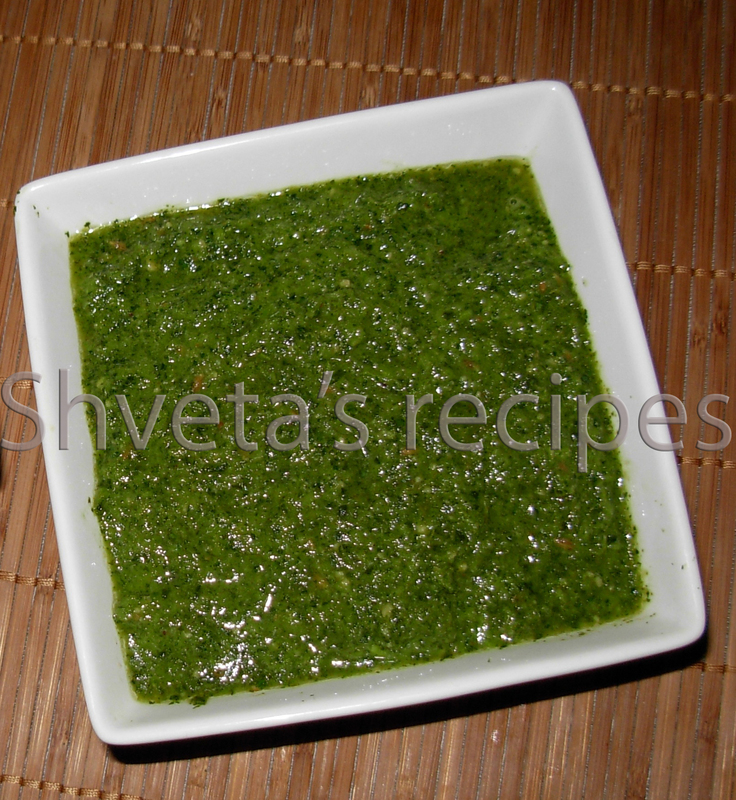 So here comes the simple yet flavorful recipe of Mint-Cilantro chutney.